Serve these hearty grilled veggies with your favorite dishes. Best of all, foil packets seal in flavors and make cleanup a breeze. 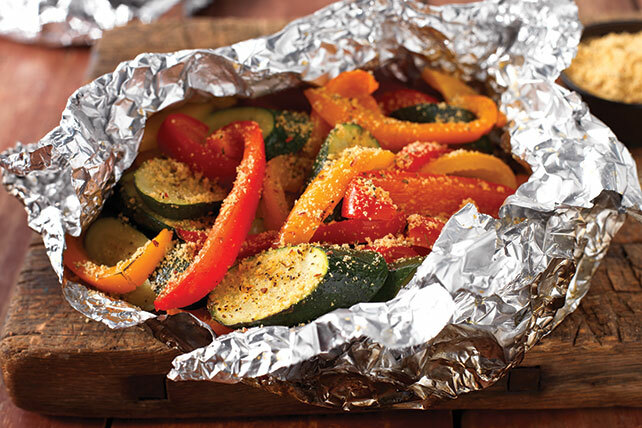 Combine vegetables; place half on each of 2 large sheets heavy-duty foil. Drizzle with oil. Fold to make 2 packets. Grill 10 min. or until vegetables are crisp-tender, turning and gently shaking packets after 5 min. Cut slits in foil to release steam before opening packets. Sprinkle vegetables with cheese.